This certified training program is intended to provide drug test administrators information to better understand the U-Tox™ product and testing procedure. Please read through all of the information within this training program. After completing the training portion, you may test your knowledge with our online certification quiz. Once you have successfully passed the quiz with 100% accuracy, you will receive a personalized certificate of training which you can print for your records. 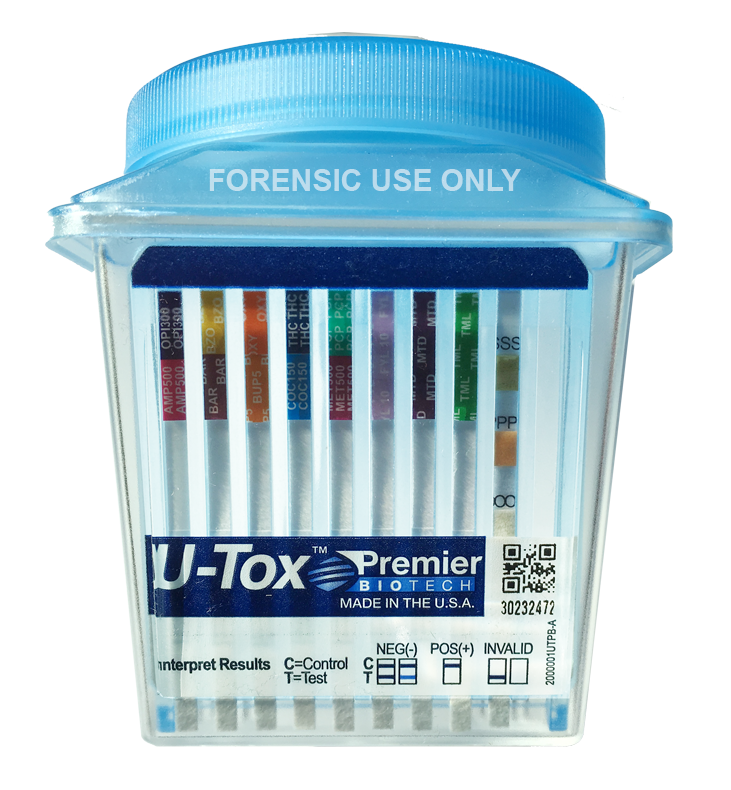 The U-Tox is a preliminary screening test for the presence of drugs. The U-Tox is a qualitative, immunoassay urine-based rapid test that incorporates collection of a urine specimen and the testing of multiple drugs simultaneously. 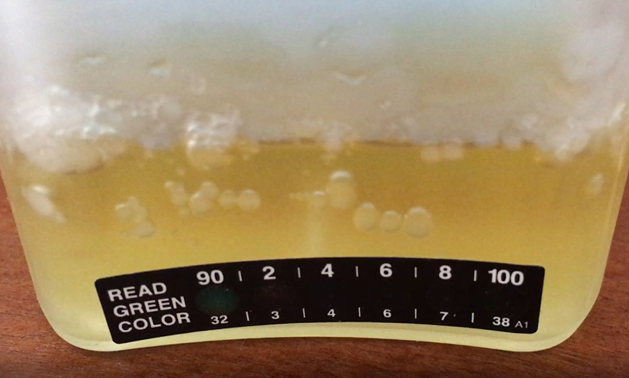 For a quantitative result or to confirm a presumptive positive screen, a second, alternative chemical method should be performed on the same urine sample. Liquid Chromatography/Tandem Mass Spectrometry (LC-MS/MS) or Gas Chromatography/Mass Spectrometry (GC/MS) are the preferred confirmation methods. Begin by checking the foil pouch to ensure that it has not been compromised and the lot number and expiration date are valid. Tear open the pouch and remove cup and lid. Request the donor to void into the cup. Once the sample has been collected, replace lid and tighten firmly to ensure urine will not leak. Place the device on a flat surface while the test is running and the results are read. 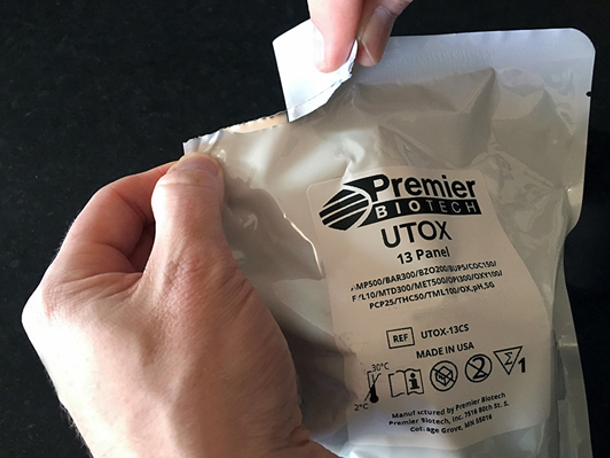 Prior to reading the test results, turn the U-Tox around to the back and read the temperature strip to make sure the specimen is within normal range. The temp should be within 90-100°F. 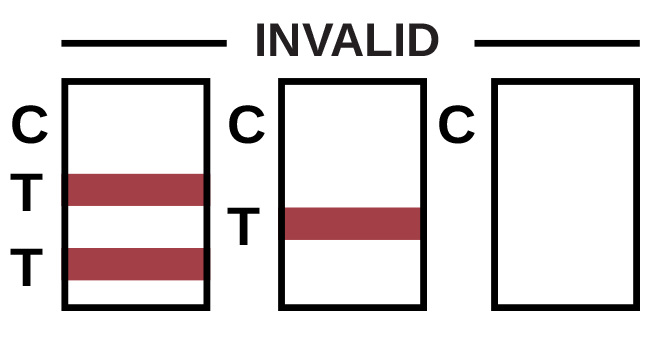 This illustration presents an invalid test as there is no Control Lines present. 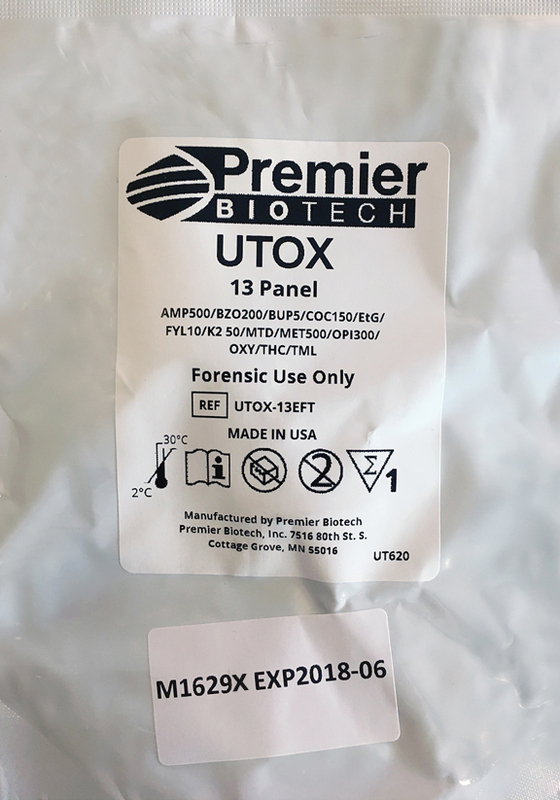 Some of the U-Tox test strips will contain two drugs. Strips with two drugs will be arranged on the left side of the cup and will be followed by individual drug test strips, then EtG and SVT (if included). The Control Line (C) is the uppermost line appearing on each strip. Before reading the Test Result Lines, verify that all Control Lines have formed. Otherwise, the test is Invalid and the test results must not be used. A Negative result is indicated by the presence of a reddish-purple Control Line and the presence of a corresponding reddish-purple Test Line. The intensity of the Test Lines may vary. Any line, without regard to intensity, color or size, indicates a Negative result for that drug. 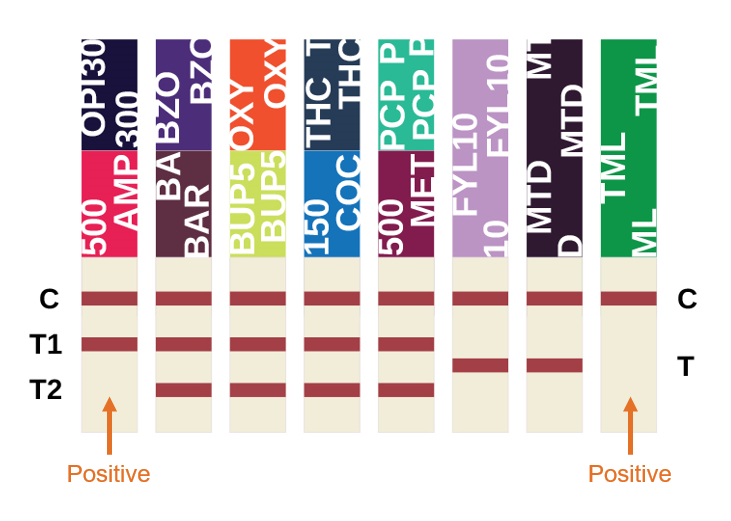 A Positive result is indicated by a reddish-purple Control Line and the absence of the corresponding Test Line for any particular drug within the testing panel. 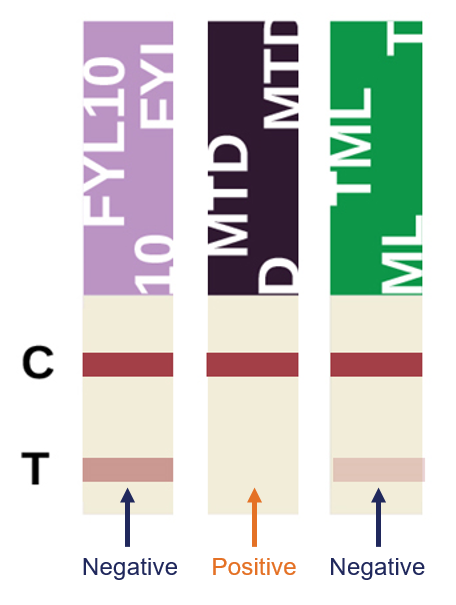 two test regions (labeled T1 and T2 below) representing each of the multi-drugs. indicates a Negative result. The absence of a line in the test region indicates an Positive result. 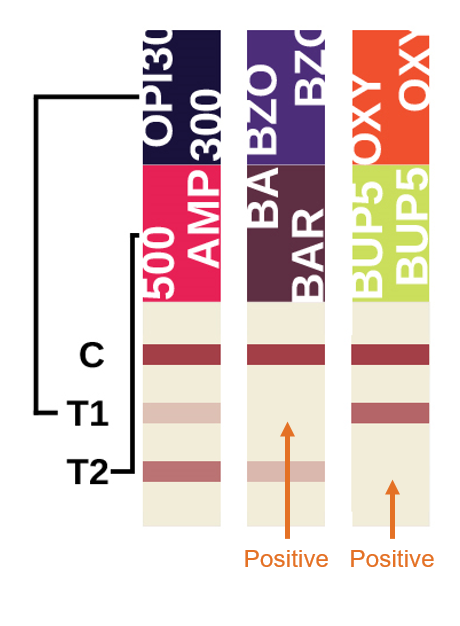 This shows an example of how the strips would be configured within the U-Tox. 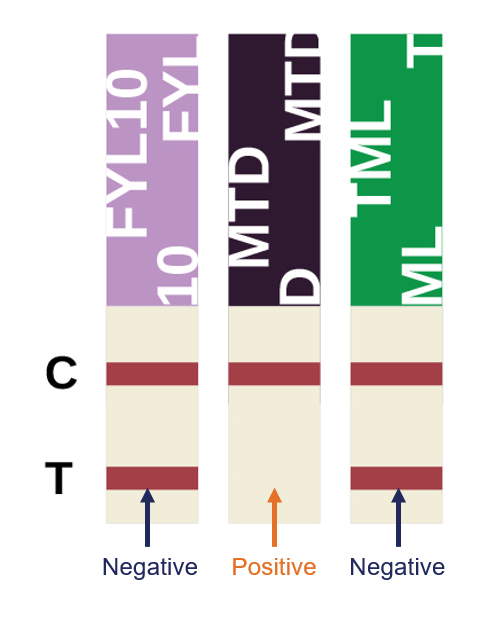 The multi-drug strips are located on the left, followed by the single strips. This shows a Positive result for AMP and TML. If U-Tox configuration includes a Specimen Validity Strip (SVT), interpret results according to directions on the supplemental SVT card. A Negative can be read as soon as both the Test and Control Lines have formed. 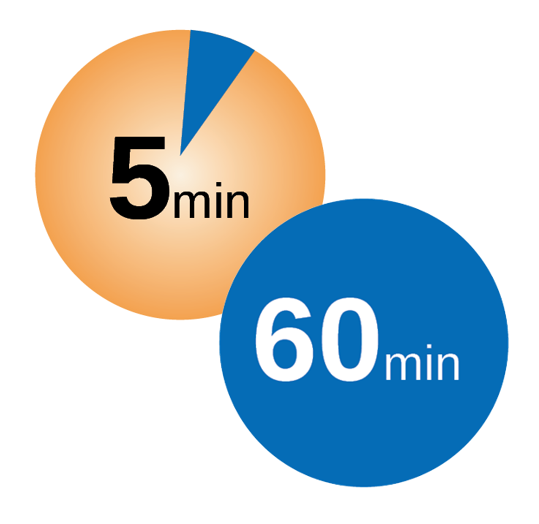 Wait the full 5 minutes before reading a Positive result. Results are stable up to 60 minutes. You have now completed the U-Tox training. You may go back over any or all of the material above anytime. Once you feel confident with the material presented, you may proceed to the certification quiz by clicking the button below. After you complete the quiz with 100% accuracy, a certificate will be generated on your screen that you may print for your records..